Inspired by a little poppet called Teddy from another British Dog Products Company who instantly started playing with our own CEO of Product testing Finnbar MacBrigadoon in the Green Room of London Dog Week where we were both showcasing our products on the red carpet. Our master rope makers Paul and Ian individually handcraft our Hugo & Otto rope dog collar and lead collections from the highest grade and quality British marine grade braid on braid rope used by International yachtsmen. The Teddy Dream Hound Collar is a luxury dog collar made especially for Hound breeds with their elegant long necks. Made in a soft black 12mm braid on braid rope that has a high capacity pulling strength will not stretch. Marine Rope collars are as both practical and easy to live with and can be washed. We hot splice the rope and sew the rope together, we whip over in a beautiful Turks head knot in a pale lilac grey whipping cord at each end of the collar. We use solid brass hardware which is nickel plated for our dog hardware which is super strong. 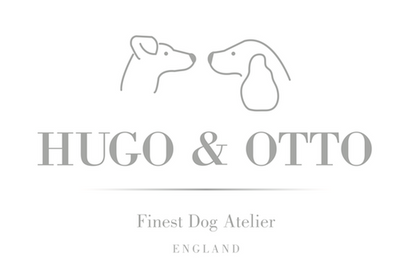 Hugo & Otto standard fit collars are available in a range of sizes and designed to fit loosely around your dog's neck and rest on the collar bone but should not slip off, when measuring your dog's neck we recommend that you follow our suggestions to fit below. We also provide a bespoke service for you made from your measurements sized which we make to order. Teddy Dream Hound Collar is available with a matching City Lead or a matching 2 x adjustable double lead. We can make your dog any size and from point of order we expect to hand make and send to you within 10 days, we will email you with an update of shipping date once received your order. On check out you will see a special instruction box to enter your measurements or any other special instructions, you also input your email address and we will automatically contact you via email. We really want to ensure your sizing is correct to confirm sizing, breed type and we do recommend that you send us a little picture of your dog whilst being measured (see measuring notes below please) so that we can ensure the fit is correct. Please note that we make bespoke orders to your measurements, any bespoke orders cannot be returned unless they are found to be faulty. It is important that you use a soft tape measure or use a piece of string and measure the string against a hard measuring tape, please do not pull the tape tight and let it sit where your dog's collar would normally sit. Take off your dog's collar and measure the part of the neck where the collar normally sits. Place 2 fingers between the tape and the neck to give the growth room, please do not pull the tape tight. When ordering the standard sizes order up to 2 cm larger to allow the collar to sit comfortably on the collar bone. You should not be able to pull the collar easily over your dog's head it should be secure enough when fitting so that your dog cannot pull free. If you do have any questions please email us on sales@hugoandotto.com and we can advise you. nb: The measurement when making our collars is taken from the brass ring that connects the collar to the end of the opposite brass clasp (not the rope end to end). We have applied a Standard shipping rate with signature required at shipping address. If you require a different method of shipping e.g. Courier Shipping only or you would like to add other products to your order please email us on sales@hugoandotto.com where we can adjust your shipping rate prior to payment.